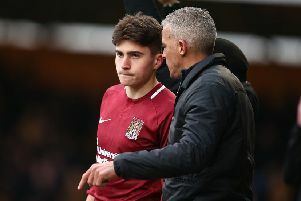 Cobblers boss Keith Curle will leave ‘speculation to other people’ after confirming that Shaun McWilliams, Ash Taylor and Jack Bridge were left out for selection reasons and not injury after Saturday’s draw against Mansfield Town. While midfielder McWilliams has been in and out of the side with a hamstring problem during recent weeks, Taylor’s omission caused much more of a stir given the regularity with which he’s featured under Curle. There’ll be a lot of talk if players don’t make the starting line-up from now until the last game of the season but that’s speculation for other people. 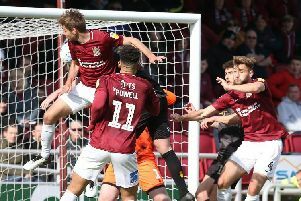 Since returning from injury in January, the 28-year-old centre-back had started 13 successive matches up until the visit of Mansfield on Saturday when he was left out of the squad altogether, despite Curle opting for a three-man defence. Charlie Goode and Jordan Turnbull were instead chosen over Taylor as they returned to the back three alongside Aaron Pierre, with George Cox the only defensive option on the bench, while Jack Bridge, who started the previous two matches, was also reduced to a spectator on Saturday, watching on from the press box. “They weren’t injured,” confirmed Curle after the 1-1 draw. “But the headlines have got to be about the emerging talent (Scott Pollock) and the 18 that performed and represented the club on Saturday. Curle has previously suggested he’s already decided who to keep and who to let go once the campaign ends on May 4 but his mind could still be swayed should his players impress during the four remaining matches of the season. “There will always be talk between now and the end of the season regarding the future of players at the football club,” he added. “I fully understand that but it’ll be the same answer - the right thing to do is that the players will be the first person to know. “That is how I operate and as soon as the season ends, I’ll have a conversation with the players individually and they will be made away of my future plans and that’s how it has to be.